Whenever snow melts, it poses a great risk to the surrounding. The water so produced can result in seepage in a basement or crawl space. Thus, not only heavy snowfall, but a light shower may be dangerous too. Snow melt increases the groundwater table. This leads to absorption of water by the cracks in the walls. Simple waterproofing measures are almost enough to deal with such a situation. However, there are a few additional things that you must keep in mind. A sump pump is a very necessary device as well. Conduct prior tests with your sump pump. Make sure that the pump works properly and consistently. You can do this via a water test. It should be done at least twice a month. This guarantees the proper functioning of the pump. However, it should compulsorily be checked before the snow starts melting.dition. Make arrangements to anchor it along with the wall. Excavate the ground till the existing weeping tile. Then, join a section of the tile with the primary weeping tile. This arrangement can then be stacked in the wall. It should be covered with a drain cover and then properly backfilled. You can use a decorative rock to conceal the entire arrangement. This protects the existing structure from any damage. 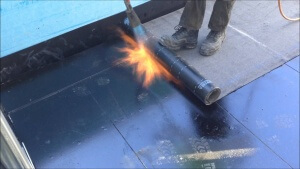 There are some other inside waterproofing methods which may interest you. For example, the gutter downspouts should be extended by a minimum of 4 feet. This prevents the water from flowing down to the basement. Small rain barrels can also be placed to collect the rainwater. A lot of water will be produced from the melting of snow on the gutter. This can be harmful to the building. Also make sure that no snow gets collected along the edges of your house. Make that extra effort of shoveling the snow from there. In case the water seeps in, it can lead to other problems as well. The collected water can cause a musty smell throughout the premises. Pests may become active too. It is necessary that you pump out the water before it starts causing water borne diseases. As is evident, it is very necessary to keep clear of snow. Prevent the growth of mold and mildew by removing excessive snow around your home. Especially in spring, when the snow melts, waterproofing becomes important. Call an expert plumber like Dr.Pipe Drain and Plumbing Services right now to know what else you need to do for waterproofing.